Keep a stash of pantry ingredients and fresh veggies on hand for these delish dishes. With names like Sweet-Hot Asian Noodle Bowl and Roasted Red Pepper-Caesar Tortelloni, you know these recipes are totally tuned in to flavor and deliver the fresh feel you want on a hot day in August. (Actually, several of the dishes are equally good served hot, cold, or at room temperature.) Follow our tutorial on cooking pasta, so you'll stress less with the prep and focus on the joy of eating. Big pot: Use one with a 6- to 8- quart capacity to cook 1 pound of pasta. We call this size pot a "large Dutch oven" in our recipes. Lotta water: Fill the pot three-quarters full with water. Cover the pot, and bring water to a rolling boil (large bubbles cover the water's surface) over high heat. Salt It? : We salt the water, but you can leave it out. Add about 1 tablespoon salt to a 6- to 8-quart pot to cook 1 pound of pasta. Down to business: Pour in the pasta, and stir with a wooden spoon. Bring the water back to a rolling boil, and maintain it for the remainder of the cook time. Leave the pot uncovered. Stir the pasta two or three times during cooking. Read the directions: Check the package label for accurate cooking times. A cooking range is given on the directions. Cook for the shorter time if the pasta will receive additional cooking, as in a casserole. Cook for the longer time if the pasta is to be sauced and eaten immediately. Taste test a piece near the end of cooking. 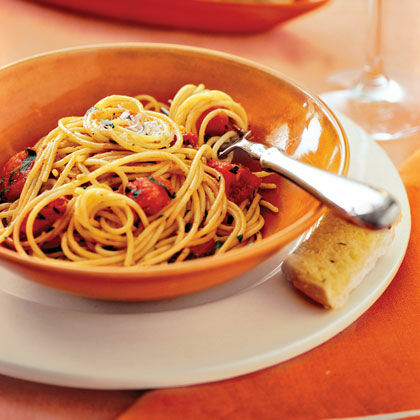 You're done: Drain pasta in a colander, and shake gently to remove most of the excess liquid. Rinse the pasta only if you are making a pasta salad. The starches that cling to the cooked pasta will help the sauce stick. Pair the right pasta shape with the right sauce. Generally the wider or bigger the pasta, the chunkier, heartier, or thicker the sauce can be. Long, thin shapes work best with oil-based sauces, pesto, and basic tomato sauces. 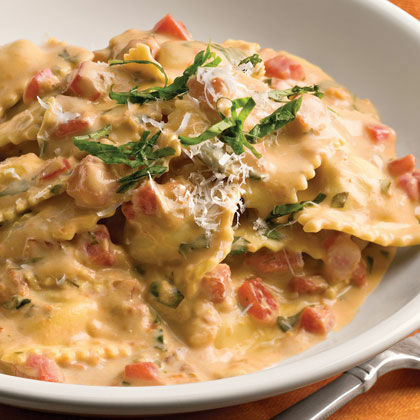 Filled pastas are great partners with smooth, light sauces or a simple drizzle of olive oil.